The story of Victor Frankenstein and the monstrous creature he created has held readers spellbound ever since it was published two centuries ago. On the surface, it is a novel of tense and steadily mounting horror; but on a more profound level, it offers searching illumination of the human condition in its portrayal of a scientist who oversteps the bounds of conscience, and of a monster brought to life in an alien world, ever more desperately attempting to escape the torture of his solitude. 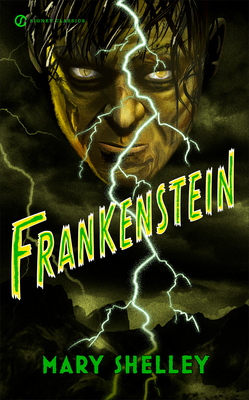 A novel of hallucinatory intensity, Frankenstein represents one of the most striking flowerings of the Romantic imagination. Born in London, Mary Wollstonecraft Shelley (1797-51) was the daughter of William Godwin, a noted social theorist, and Mary Wollstonecraft, one of the leading literary women of the day. Her mother died soon after her birth, and Mary was raised first under the care of servants, then by a stepmother, and finally in the rarefied intellectual atmosphere of her father’s circle. In May 1814, she met Percy Bysshe Shelley and, in July of the year, moved with him to the Continent. Two years later, after the death of Shelley’s wife, the poet and Mary were able to wed. It was in Switzerland in 1816, as a result of a story-writing competition among the Shelleys and Lord Byron, that Mary began Frankenstein, her first and most famous novel. Published in 1818, it was followed by such works as Valperga (1823), The Last Man (1826), and Falkner (1837). In 1822, after the death of her husband, she devoted herself to the upbringing of her son and the securing of his right to the Shelley family title. Douglas Clegg is the award-winning author of more than twenty-five books, including Neverland, Isis, and The Vampyricon trilogy. His fiction encompasses gothic, suspense, fantasy, and horror themes. An e-book pioneer, he created the internet’s first e-serial novel, Naomi, which was released in 1999. Harold Bloom, the country’s preeminent literary critic, is Sterling Professor of the Humanities and English at Yale University. He is the recipient of numerous honors and awards, including the Gold Medal of the American Academy of Arts and Letters. Among his most important books are The Anatomy of Influence: Literature as a Way of Life and How to Read and Why.